As more and more companies offer a flexible work environment and less of a traditional 9:00 to 5:00 schedule, our personal and work calendars can start to blend together. Juggling two separate calendars: personal and work, can get difficult, potentially leading to double booked or even missed meetings. Secure Mail makes it easier to keep up with work calls, meetings, or appointments. Personal calendar overlay allows users to view their personal events in Secure Mail, and with the latest Secure Mail release 18.9.0, end users also get the flexibility to access their Secure Mail calendar events from their native apps or from a third-party app that connects to their native calendar app. 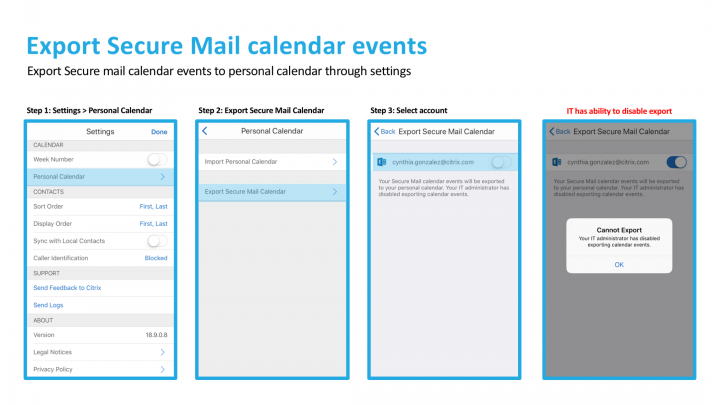 The new feature “export Secure Mail calendar events,” allows end-users to export Secure Mail calendar events to a device’s native calendar app: transferring subject, location, availability and notes. Export Calendar will be on by default. Secure Mail admins can disable it or decide which fields should be exported to the native calendar app from the console. Visit docs.citrix.com for additional information, including full feature list, known issues and fixed issues for the 18.9.0 release of mobile productivity apps.